Pressure washers are typically used for outdoor cleaning jobs, such as washing cars, or hosing down patios, as well as cleaning garden furniture. If you want a quick, deep-down clean, then a pressure washer definitely beats a hose and scrubbing brush, and saves hours from your day. Most modern power washers are compact and lightweight, making them easy to move around, and convenient to store in a shed when they’re not needed. If you have a caravan, car, patio or decking area, or even just garden furniture, a pressure washer is almost essential. It not only saves time, it is also easier on your hands and back than doing a thorough manual clean. And, in general, because of the intense, continuous flow of water, a power washer gets better results, faster. They can also take the effort out of cleaning the outside of windows, and save you money on getting a window cleaner in! In the garden, they can often be attached to gravity-fed water harvesting barrels, such as rain butts. The pressure washer produces a continuous stream of intense water in a jet, which produces a ‘blasting’ action, releasing dried on dirt and tough-to-remove particles to give a deep, all-over clean. The most important thing to look for when buying a pressure washer is the hose length. You don’t want to be struggling to reach round your car or caravan if you don’t have to, and, if you can do the whole decking or patio area from just outside the French windows, so much the better! Beyond hose length, you want to make sure the one you buy offers all the accessories and attachments you might need for your intended cleaning jobs. It will also need to be small enough to be stored safely, in a dry, indoor area (such as a shed or garage) when it is not in use. 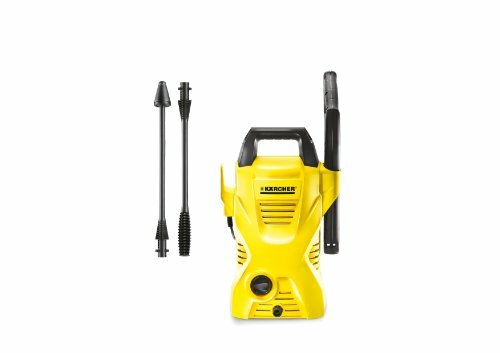 As the name suggests, this power washer features a petrol motor. This does mean you’ll need to buy petrol, and oil, for it, which is an additional expense. It also makes it heavier than other models. 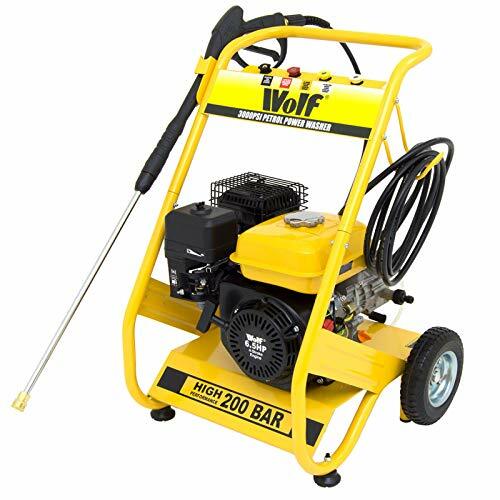 The Wolf pressure washer features all-terrain wheels, enabling it to cope with uneven gardens, concrete yards, and gravel driveways, and a steel frame for increased durability. The Wolf does have a few drawbacks, however: the oil filters are awkwardly placed, making them difficult to access, and the washer itself is noisy, and not as powerful as it would appear. The petrol engine would suit those looking to clean areas where an electrical supply isn’t readily accessible – a garden shed or greenhouse, for example, or an area of decking that is a distance from the house. This is an expensive machine to purchase, and will have the additional running costs of needing petrol and oil at regular intervals. 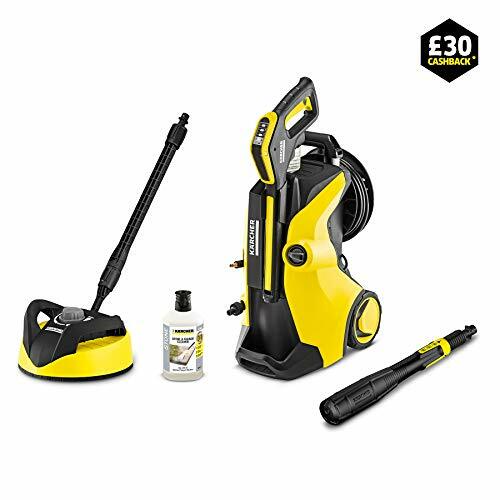 This pressure washer features an air-cooled motor, which helps prevent overheating, and an impact-resistant casing, meaning you don’t need to worry about bumping into the garden furniture as you’re dragging it around. However, owing to it being somewhat awkward to manoeuvre, the impact-resistant casing is necessary. Also, the hose is somewhat short – a major frustration when combined with the lack of manoeuvrability. The short hose and lack of manoeuvrability on this pressure washer are a real let down, especially in combination. It might, therefore, be best suited to someone just looking to clean a small patio or decking area on a regular basis. The air-cooled motor is a bonus during prolonged use. There are definitely more functional options available in the same price range. 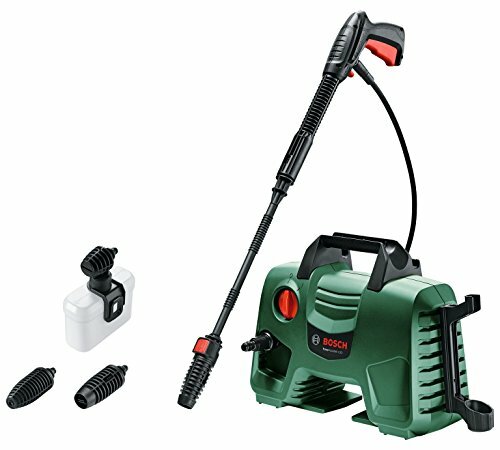 An affordably-priced power washer for domestic use, the Bosch offers a clear vision water tank, so you can easily check the water level. It is a little tricky to assemble, despite claiming to be “easy assembly”, and quite noisy in use – although that is to be expected from a pressure washer. However, depending on how well you get on with your neighbours, it may not be all that welcome. It also has the odd quirk of not enabling the brush attachment to be used with detergent running through it – the detergent needs to be applied first, then brushed through. This isn’t a big niggle, but it does take up more time. If you’ve invested in a pressure washer specifically to save time using a bucket and sponge on the car, this foible of the Bosch could be frustrating. With its low price tag, the Bosch is a good general purpose machine for those looking to give the patio, car, or garden furniture the occasional once over. This is a good price, and well within most peoples’ budgets. 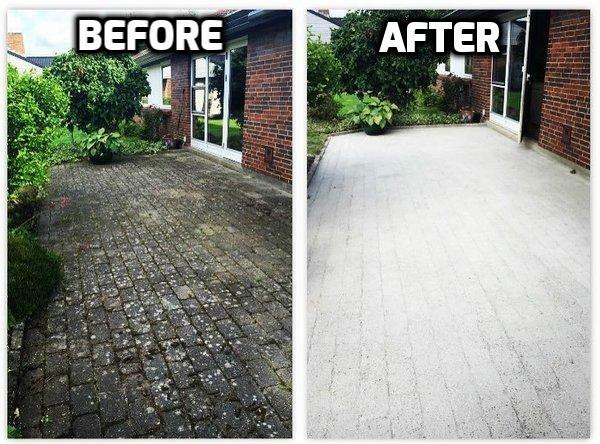 Definitely worth it if you have a patio or decking area you want to keep clean. 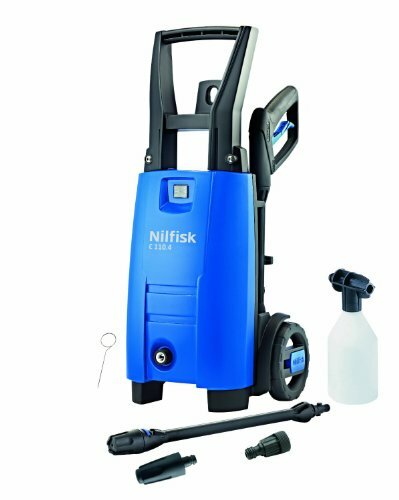 A compact, lightweight product that is ideal for those who need a pressure washer, but don’t have much storage space. The K2 will tuck away neatly in a corner of the shed, until the next time you want to use it. It is suitable for use with water butts, with the appropriate attachment, and is ergonomically designed. It also features a filter, to prevent small stones, chippings, etc from entering the machine and causing damage. It is ergonomically designed, and offers a lot more power than its size might suggest. The K2 is, however, let down by a motor which doesn’t seem particularly durable. Although the motor does let this pressure washer down, it offers great versatility. It is also modestly priced, with the peace of mind of a quality brand behind it. Reasonably priced, from a quality brand. Offering splash-free cleaning and an integrated detergent tank, the K5 is pretty much everything you’d be looking for in a power washer. Our reviewer is more than satisfied with his purchase, citing its power, great cleaning results, and flexibility. He’s been cleaning up his old farm house and making it sparkle like it last did in the Downton Abbey era! Pretty much all those outdoor jobs that you want to get done quickly and with minimal hassle. The K5 definitely offers premium functionality but at a price. 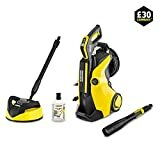 Definitely a good buy for those with busy lives who want high-quality, professional results from their pressure washer.